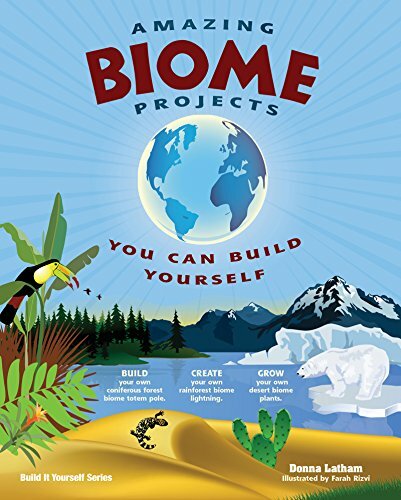 Amazing Biome Projects You Can Build Yourself takes kids ages 9 and up on a circumnavigation of the globe to learn about Earth's terrestrial and aquatic biomes. Kid's will wander through forests, sizzle in deserts, shiver in the tundra, plunge beneath the seas to explore coral reefs, and slog through marshy waters. Along the way, kids will encounter flora and fauna adapted for survival in each unique climate zone. They'll learn about gnarly krumholz trees, bioluminescent sea creatures, camouflage, carnivorous plants, and blubbery marine critters. In each biome, people who use science in their jobs are highlighted, whether at the site of a disastrous oil spill or an oh-so-cool mastodon dig.